A chocolate-themed garden is easy to design, although planning for a winter range of colour and fragrance is quite challenging, given the UK’s rugged climate. Because summer plantings are so easy, the best way to tackle the colder, harsher months is to use landscaping features to follow the chocolate theme. This has two advantages: it means you don’t have to cosset and protect tender and demanding plants through the months when gardening is least fun and it brings into prominence your hard landscaping at a time when most gardens look boring and bleak anyway. Commercial growers and plant hunters have recently cottoned on to the fact that even small gardens are being designed to certain themes and because this is a certain way to ensure continued sales and premium prices, they are increasingly inclined to name plants in ways that will fit with the most popular current themes. So, for example the current crop of perennials are often being given chocolate or wine based names, which may have little or no real relevance to the plants appearance or fragrance. For this reason it’s important to get good recommendations about the plants you buy, if possible, seeing them already in bloom in other gardens. There are some plants that really do perform as promised, and one of the more recent specimens to wow the gardening world is a dahlia named ‘Karma Choc’. The flowers are well formed, opening as a dark crimson and becoming almost purple-black as they age, but it’s not the colour but the scent that makes them notable. It does require warm, still air, but when that arrives, in the height of summer, Karma Choc produces a truly intense chocolate scent that travels several feet from the plant and makes bees quite dizzy! Plant the dahlia alongside a Chocolate cosmos (latin name atrosanguineus) which again needs warmth to produce a truly powerful scent as it’s a native of South America. It has more brownish-red flowers than the dahlia and a more vanilla based fragrance, so together these flowers produce a spectrum of chocolate odours that is quite exquisite. After scent, you need to consider colour and the somewhat overlooked Heuchera has a fantastic cultivar 'Chocolate Ruffles' which is easy to grow, and offers a beautiful chocolate coloured foliage which works particularly well with silver-leaved plants or when set against white hybrid tea roses which offer a lovely complementary fragrance to chocolate and harmonise beautifully with the rich chocolate tones of the Heuchera’s leaves. If you have a south-facing wall or trellis, look out for the annual Chocolate Vine (latin name akebia quinata) which is annual in the UK although it can be semi-evergreen and invasive in more gentle climates. 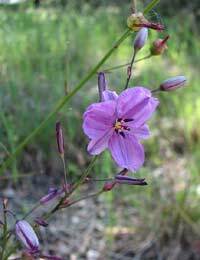 It has large, three-petalled flowers in a matte mauve colour and they have a rich milk chocolate fragrance. One of the most amusing ways to play with the chocolate theme in winter is to use herbaceous trees as the ‘bones’ for winter displays. Tree dressing is an old English tradition, currently undergoing a revival. It was a pagan practice to encourage fruit and nut trees to produce a crop the following year by hanging their branches with offerings. Today tree dressing is a purely decorative activity for most of us. Consider hanging gold and silver discs (like chocolate money) from bare tree branches at Christmas or buy Styrofoam balls, spray them dark chocolate brown, cream and mid brown and then decorate them with felt flowers to look like puddings and chocolates. Hang them from the tree with thick coloured cords to give a bright effect. Match the tree dressing with round paving slabs in a dark chocolate colour like chocolate after dinner mints. These slabs look best laid against a cream-coloured gravel and if you can find the lighter beige/brown variant (they are surprisingly difficult to get hold of) you can arrange the paving to resemble chocolate buttons and enhance this approach, in winter, by setting small pots containing mint-scented herbs on the gravel between the stones. The best perennial for this purpose is Pennyroyal, a strongly peppermint-scented herb with tiny deep green leaves. As you brush past it, this unassuming herb emits a heady fragrance which will resonate with the colours of the slab to evoke the idea of mint chocolate. To finish your winter-themed ‘chocolate box’ garden, use chocolate and vanilla scented tea lights, hung in the trees or popped into clean empty jam jars and placed along the path, to provide an extra layer of scent to fill your winter garden with delicious sensations.